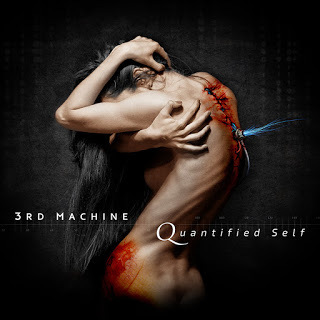 3rd Machine is a band that has been around for a while now, and it shows on their new album Quantified Self. They have a style that is pretty sophisticated and involves a large scala of diverse musical concepts ranging from symphonic rock, not unlike Pink Floyd sequences with beautiful solos screaming over synths that seamlessly flow into a pummeling death metal riff with deep grunts and double bass thundering underneath it all. They have a lot of the French band Dagoba in them, and I do not say this without merit, because the comparison is an interesting one. They have formerly toured with the French band and the two styles are sometimes eerily similar. Is the one a rip-off of the other then? It’s hard to make a case for as Dagoba’s first full-length came only two years before 3rd Machine and it wasn’t like they were an instant gamechanger in the metalworld sprouting all sorts of bands joining the parade of a new fad in metal music. No, 3rd Machine and Dagoba have independently evolved into a similar sound which is part industrial, part death, and part proggressive, and that is not inherently problematic. I say, bring on more of these bands and make this the millionth subgenre we metalheads love to bicker about! But let’s not dwell on the comparison too long, because 3rd Machine has merits of its own, and for my part, I like 3rd Machine more than Dagoba with every listen. The things that set 3rd Machine are difficult to pinpoint, but still I will have a go at some of them. The thing that stands out is the eclectic mix of the death metal grunts and rhythmic guitar pummeling along with the drums while the solos, almost serene and almost too light for the music seem to fly overhead. For some reason though, it works a charm, and gives a depth to 3rd Machine’s music that Dagoba has sometimes lacked on albums. Where Dagoba’s riffs sometimes – especially on the first albums – get a bit stale, Quantified Self keeps re-inventing itself with every song, whether it is an eerie effect on the voice or a Pink Floyd-esque solo interlude or an almost grindcore-like climax that steers the song in a different direction, it rarely doesn’t work out very well. Songs to look out for especially are Ultimate Intelligence which showcases the Pink Floyd in this album very sweetly, before blowing your ears out with a deafening soundwall and 1953, a song about the catastrophic flood in the Netherlands of that year, which is very well executed. For a beautiful kick up the arse, Firewall might take a while to build up but kicks in half way and doesn’t let go. In short, 3rd Machine and Quantified Self are perhaps a clone of a subgenre that has as yet not fully come to growth, but they are not doing a half-assed job excelling in it. The diversity and power in the music are extraordinary and I can’t wait for this band to be one of the biggest names of the Dutch metal scene.